Any fellow blogger users out there? Blogger debuted a crazy spanking new editor over the past few weeks. I am not sure I'm a fan...it took me about a dozen tries to get a new post to load. Today is Father's Day, although I am not spending it with my dad. I had some flag football earlier today (loss! boo!) and I'm sure my dad is spending it happily on the golf course. I'm about to head out to do some weeding since it's finally stopped raining. I really should get some pictures of my out of control gardens. I also started a compost bin yesterday...clearly I lead an amazing and exciting life. I kind of want some beehives like Finny Knits has, but let's be honest: I can barely keep two dogs and myself fed and alive, I'm supposed to be responsible for a thousand other beings? Also, she has an awesome awesome yard and I'm jealous. 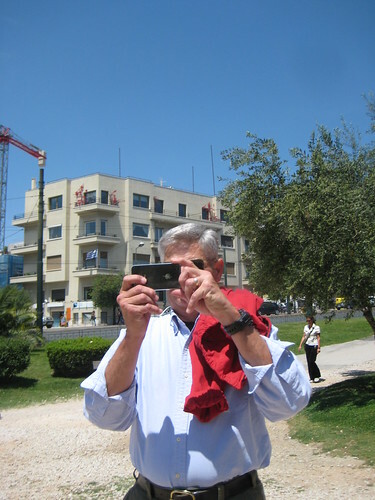 This is a pic I took of my dad taking a pic of me in Greece. You can't really tell it's Greece except that there's some bougainvillea behind him, and there is bougainvillea in Greece. Erego, he is in Greece. Happy Father's Day to an awesome dad!